Room for everyone and include Full Kitchens, 2 rooms in the same building but can be rented separately and share the porch. 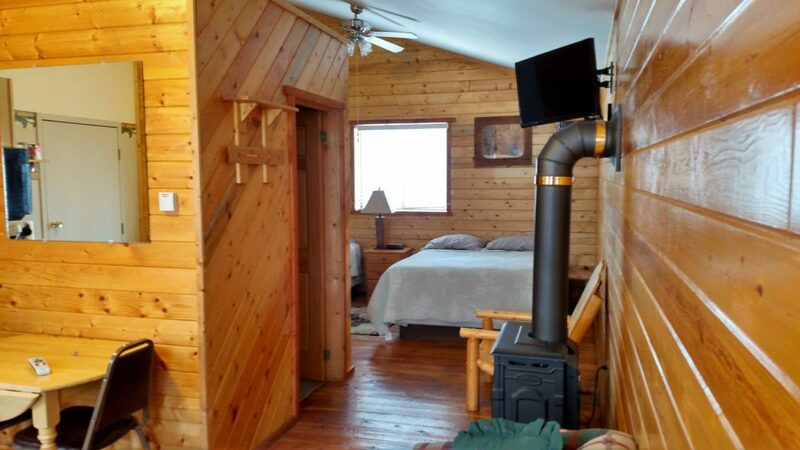 Big Moose Resort’s two Luxury Cabins have 2 comfortable queen beds, a full bathroom with tub/shower combination, full-size kitchen that includes dishes, pots and pans, and cooking utensils. Additional amenities include a gas fireplace, BBQ grill, satellite TV, and limited WIFI. Sitting side by side and connected with a beautiful deck and an adjoining inside door, these two cabins can be rented individually, or for larger groups, can be rented together to make the perfect retreat. Rates vary from low season rates at $110 to high season rate of $150 night. Rooms: 2 Queen beds, full bathroom with tub/shower combo. Utilities: Gas Fireplace, BBQ grill, satellite TV, limited Wi-Fi, and Outside Deck. Full size Kitchen includes: dishes, pots, pans, utensils.